﻿ What's the best recovery software to restore text? Position: Home > Mistaked to delete file > What's the best recovery software to restore text? What's the best recovery software to restore text? Text contains only letters, digits, and symbols. How to recover text you need？especially you have been working on the text for a while. Luckily,There are several ways we can restore deleted text. 1. When you delete a text file, immediately Hold down the "Ctrl" and "Z." This keyboard shortcut recovers deleted items. 2. Click "Undo" if you are using Windows-based programs, such as MS Word and MS Excel. 3. Open the Recycle Bin and locate the text document. Right-click the text document and click "Restore". 4. But if you still can't recover your text, you may need the best recovery software to help you which named Bitwar Data Recovery. Bitwar Data Recovery software is a best recovery software which can recover lost or deleted text from different storage devices such as internal & external hard drives, pen drives, memory cards, etc. The software will let you see the recovered file preview before recovery. First you should stop the partition which the text lost. And then download the best recovery software - Bitwar Data Recovery to restore text. Download and install it on the product’s official website on your computer: https://www.bitwar.net/data-recovery-software/ . Please remember Do not save Bitwar Data Recovery software or any files on to the partition where you lost your text files. Step 1:When the installation is complete, start the program and choose the partition/devices where your text lost and click “next”. Step 2:Select Quick Scan if your text lost by shift+delete on any storage device or emptied/deleted from recycle bin. If files are not override by other data,files can be fully recoverd. Step3: select types of files. We want to restore text type. So we select the document types and press “next” button to start scanning. Step 4:The scanning process is a very short time and you can have a sip of coffee...After the scan, you can select the text file you deleted from the scan results and preview them separately. Bitwar Data Recovery supports previewing as many as 300 different file types, including text. 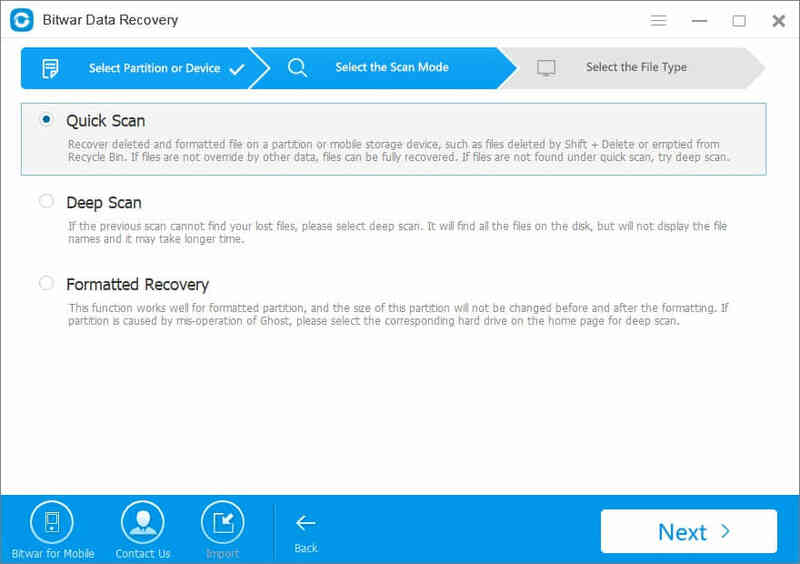 When you find the lost text, select it and click the "Recover" button to save it to another partition or external device. Except for recovering lost text, Bitwar Data Recovery can also recover pictures, video, office documents, music files, and applications from all your storage devices.You can download this free data recovery software now to have a try.